Paul Strank Roofing are proud to announce our renewed and expanded sponsorship of AFC Wimbledon to further support the club on their way to the top. As many of you already know Paul Strank has had a long standing relationship with the club and throughout his time as a supporter Paul’s passion for Wimbledon has never wavered. We can announce further and with the greatest of pleasure, that having recently launched the Paul Strank Charitable Trust we wish to continue our tireless support for local children’s charities and causes, to aid the most disadvantaged in our community and to achieve these goals, we intend to support the AFC Wimbledon Foundation as they use sport to reach as many children in the community as possible. With our support the AFC Wimbledon Foundation can continue their work in helping young people from the local community realise their potential as valuable members of the community. 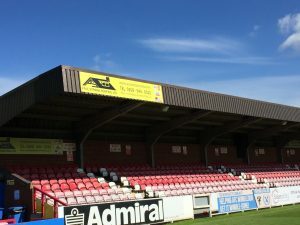 Paul Strank Roofing and AFC Wimbledon have always had close ties, and with these new developments we look forward to working together for a brighter future for the club, our fans and our community. Paul Strank and the team at Paul Strank Roofing Ltd would like to wish Neil and the team the best of luck in the upcoming season – COME ON YOU DONS! Paul Strank’s support for Wimbledon FC started way back in 1961 where as a ten year old pupil of all saints C of E Primary School he played in the school’s football team, the school gave every team player a free pass to watch a game and from that moment Paul was hooked and Wimbledon FC gained a lifelong fan. He followed them through the southern league and through to the premiership league and was even present at the FA cup final in 1988 where to Paul’s delight they won! In 2002 Paul was left devastated like many of the other fans when Wimbledon FC went to Milton Keynes, but thanks to Ivor Heller, Trevor Williams and Marc Jones, AFC Wimbledon was born on the 27th May 2002. Paul has carried on following his team as they have gone from strength to strength. Paul first became a sponsor of AFC Wimbledon back in 2006 and has never looked back. Paul’s support has played a big part in the success of AFC Wimbledon over the last few seasons and in Summer 2008, in one of the club’s biggest ever sponsorship agreements, the main stand at Kingsmeadow Stadium was renamed the Paul Strank Stand,which to this day has been one of Pauls most gratifying moments in his life. Paul has sponsored many games over this time including the game held on the 13th April 2008 at the new Wembley Stadium where AFC Wimbledon Played Corinthian Casuals. Over the years Paul has become very well known for his constant and uplifting contributions to the community and wants to help where ever he can, because of this solid commitment and dedication to both the community and the club Paul Strank roofing in association with AFC Wimbledon come together whenever they can to raise money and public awareness for charity’s or organisations such as BBC’s Children in Need, and closer to home like the AFC Wimbledon Academy.